How to Help a Puppy Gain Weight? Underweight puppies should be given a calorie-dense dog food to get back to a more normal weight. 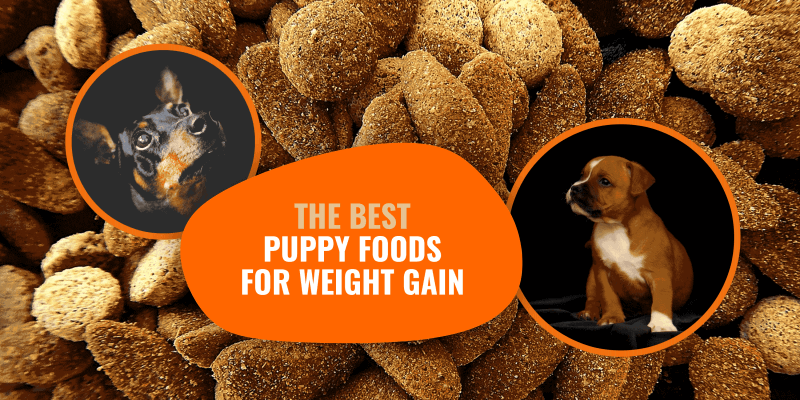 We’ve rounded up the top mass building strategies for puppies as well as the best puppy foods for weight gain. Some puppies should be given larger meals. Whereas, other puppies with smaller stomachs, should be served more but smaller meals every day. The contents of the meals matters, too. Any quality weight gain puppy food should contain bioavailable and easily-digestible proteins, vitamins and micronutrients. One common cause of underweight puppies and lack of weight gain is due to the puppy’s overall caloric intake. To avoid any problems, it is best to discuss your dog’s individual calorie requirements with a vet. That way, you will be able to properly calculate the number of calories the pup needs. Here we list and discuss the most appropriate strategies to help a puppy put on weight. Puppies aren’t yet regular eating dogs so having ups and downs is normal. However, witnessing an underweight puppy needs action from your part. Increasing the amount of food a dog eats will help him grow at a faster rate. You can do this by feeding larger quantities to his regular meals than you usually do. Or, you can feed the same weight of food but using more calorie-dense foods. Remember, when adding extra quantity, ensure it is in the form of nutritious bulk. Avoid feeding him processed foods just to add more calories to the diet. Ensure these foods are from lean meats and healthy fat sources. Meal servings must be tailored to the underweight puppy based on the breed, activity level, and reproductive status. Spayed and neutered dogs, for example, may require fewer calories than dogs who are intact. If the puppy has a very poor appetite or tends to have difficulties finishing a meal, increasing his calories may not be a suitable solution. 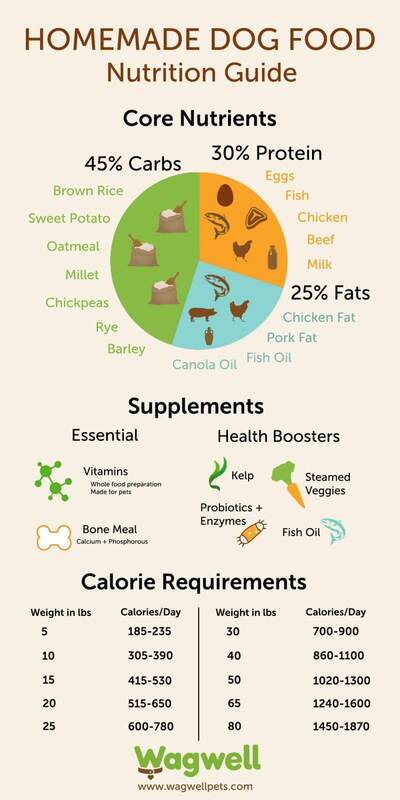 Homemade dog and puppy meal nutrition guide from WagWell. The other viable option to increase his calories is by feeding smaller quantities but more often throughout the day. Do this by adding in one or two extra meals per day and keep the overall daily intake the same. This is a good strategy to help a small or toy breed puppy gain weight. When adding more meals in the day, make sure you feed a little bit less than the usual serving amount. If he is generally fed twice a day, make it three times. By doing this, it is not mandatory that you change his diet, just the number of feedings. In some cases, feeding large quantities to a puppy is not ideal. Due to the abrupt change in his caloric intake, some dogs may outright reject the extra quantity that they are not accustomed to eating in one meal. You should also avoid making him too full as this can make a puppy feel sick and may vomit. The problem with underweight puppies is not always how much food they are being fed, but rather, the palatability of the food itself. Not all dogs enjoy the taste of dry food and some only eat the bare minimum. Switching to a wet food base can fill up a dog and give him the additional calories and supplements he needs in his diet to fatten up. Home cooked dog meals are also more appealing to dogs. If the food has more visual appeal, dogs will tend to eat more of it. Providing home-cooked meals also gives you the leverage of controlling what goes into the food. You also get the added assurance that your pet is getting the best nutrition out of his meals. Dog food with nutritious properties will give your dog the vitamins, minerals, and nutrients necessary for growth. Whereas, low-quality food contain fillers that bring no value whatsoever nutritionally besides satiating the dog. Furthermore, the best puppy food for weight gain is food specially designed for small puppies, as they provide more bulk in proteins required for muscle gains. Remember that transitioning to a new food must be done gradually, especially for puppies. 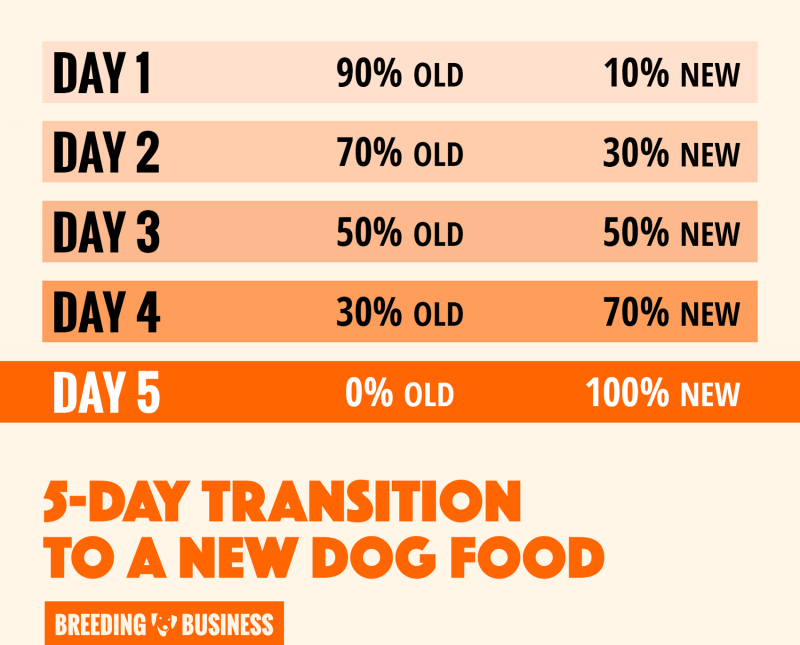 Infographic: introduce gradually the new food to your dog and monitor his health during this transition period. In rare cases, you may have to revert back to the original old food. Underweight puppies also face the social challenge of other dogs who are in their vicinity. These other puppies may affect their eating habits and thus, their weight. Other dogs can influence his eating pattern and behavior, thereby, causing the puppy to inadvertently eat less, or not eat more when offered. Feeding underweight puppies alone should prove to be a viable option in crowded litters. Isolate the puppy in another area or room, for example, and feed the underweight puppy accordingly. Other behavioral cues may include a puppy that is having to compete with other dogs in the household. This eating competition should be avoided by feeding the puppy separately from the others. This will also help reduce stress in the puppy and help the owner determine the exact amount of food the puppy is eating. 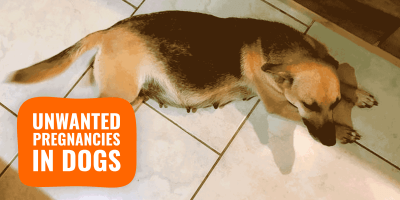 If all other alternatives in attempting to put on weight on an underweight puppy have failed, then another option available is to provide weight gain supplements for dogs. Weight gainers have high palatability and high-calorie content per gram. Using supplements as a way to encourage weight gain in a puppy should generally be advised by a professional first. Before administering anything, check with your vet so that he or she can offer the right supplementation for your puppy’s individual needs. Too much of one supplement can actually harm your pet. For example, excess consumption of calcium can lead to orthopedic diseases, especially in larger breeds. 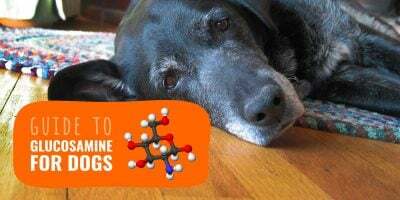 While most of your dog’s calories should be in the form of nutritious food, many supplements provide extra aid in the form of specific vitamins. Provide some fat and protein-packed treats for an extra kick in nutrition and caloric density that will help fatten him up. The most important thing you should do to rule out any other causes of low body weight in a dog is by getting its health checked out. Intestinal parasites, for example, will cause an inability to gain weight in an animal. Although it may seem counterproductive, exercise actually helps in putting on weight by increasing the puppy’s appetite. Exercise will also help in forming more muscle mass and a toned body will add more weight. Another strategy is to switch to an ad libitum feeding schedule. Instead of providing food at certain times of the days in a normal eating routine, allow your dog to freely eat from a bowl of food throughout the day. Ad libitum feeding will encourage your dog to snack on extra food when he would normally not eat. The more a dog sees food available, the more likely he will eat it, thus gradually putting on more weight. The best puppy foods to put on weight are those that contain a larger amount of fat and protein. Calories aren’t enough. Puppy food to gain weight should not be in the form of added fillers. These are often associated with processed foods as these actually work against their health. To understand why a low carb dog food is good, you need to understand why fats are problematic when your dog needs to get into a calorie deficit. Basically, the importance of protein in a puppy’s diet is crucial for the development of young dogs to ensure growth into adulthood. You can add more protein to your pet’s diet by switching out some ingredients and gradually substituting with higher caloric supplements or protein powder. As per formula, start with 10% new food and 90% of his older food, increasing the fat and protein percentage per day, so that the abrupt change in diet does not cause stomach upset. Recommended weight gain puppy foods should include a higher content of proteins and fats in order to boost the calorie density. 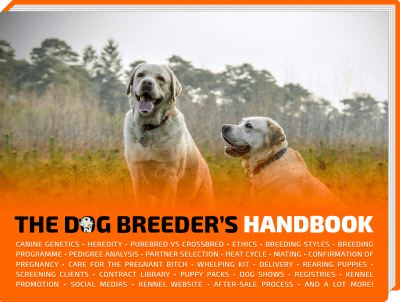 We have compared dozens of kibbles commercially available and we have handpicked the best ones. 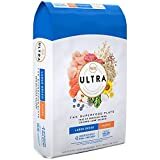 Nutro ULTRA provides one of the best weight gain puppy foods on the canine market today due to its trio of protein foods including chicken, lamb, and salmon. With chicken being the number #1 ingredient, this dry dog food is specially formulated for larger breed puppies. This super puppy food for weight gain contains the highest available nutrients using real, recognizable ingredients. The Nutro dog food is designed and crafted to promote healthy bones, teeth, good digestion, growth, and brain development. Containing zinc, omega 3 and 6 fatty acids, vitamin E, and crude fiber and protein, the Nutro adds in an additional blend of 15 vibrant superfoods including kale, chia, and coconut. Puppy food for weight gain can’t get any better than this. Rich in flavor and contains no GMO ingredients, the Nutro Ultra brand is tailored for any life stage of development and can be purchased as dry or wet food. 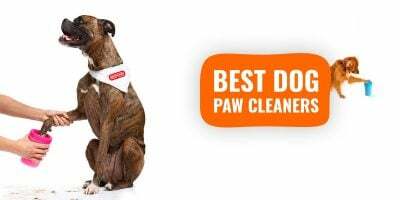 Furthermore, the wholesome ingredients provide more shine and luster to your dog’s coats. According to users, puppies born with allergies have benefited greatly and conditions have improved with this puppy food. Made in the US, it’s no question that the Nutro makes some of the best puppy food for weight gain. This puppy food for weight gain by Bully Max provides a wonderful recipe to gain lean muscle mass for underweight puppies. With 30% protein and 20% fat, this high-performance dog food provides that nutritious kick to keep your dogs growing steadily and gaining weight. Bully Max is the only 5-star rated performance dog food on the market. It is the only meat based formula in its class with real meat being its prime ingredient. Ideal for all life stages, the Bully Max weight gain puppy food contains no corn, no wheat, and no soy. This dog food provides more calories than other formulas in its kind averaging out a whopping 535 per cup. With all-natural ingredients, this premium dog food is designed to enhance performance and provide maximum energy. Suitable for ages four weeks or older and crafted in the US, this 30/20 formula definitely deserves the 5-star rating from Dog Food Advisor. It has been known to relieve diarrhea in dogs, however, some users complain of the price jump. The BLUE Wilderness pup food for weight gain is not advertised as puppy food but nevertheless, it is high in protein and it’s a grain free kibble. This makes it better than many puppy foods on the market. This particular puppy food for weight gain features real meat as its main ingredient and its high-quality protein comes from deboned salmon, fish meal, and chicken meal. The L-carnitine added to it helps with the development and maintenance of lean muscles. Containing wholesome fruits and vegetables, the Blue Wilderness is specially formulated with glucosamine and chondroitin for better bone health. This is a natural dog food that is enhanced with beneficial vitamins and minerals for a healthy oxidative balance. It provides immunity, healthier bones, and skin, as well as supports a healthy heart. This dog food is made with the salmon that dogs really love for added flavor, and with the right balance of carbohydrates and calories, steady weight increase in your puppies is assured. BLUE Wilderness is a trusted brand in the canine market, just watch for sensitive stomachs as some dogs have gotten sick due to reviews. Unlike the previous dog food brands, Bully Max is not a weight gain puppy food, but a canine supplement. This ultimate addition to your dog’s everyday diet provides a wonderful lean mass builder for your puppies, and it’s not just for bullies either! This ultra-convenient Bully Max and Gorilla Max combo supplement helps build strong muscles, increase overall strength, power, and speed. It also enhances the immunity and metabolism in your dog. The Bully Max aids in bone nourishment and helps protect the tendons. 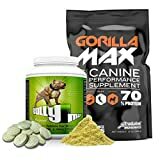 The Gorilla Max is one of the best K9 supplements on the marketplace. It comes in a powder form while the Bully Max comes in tablets. 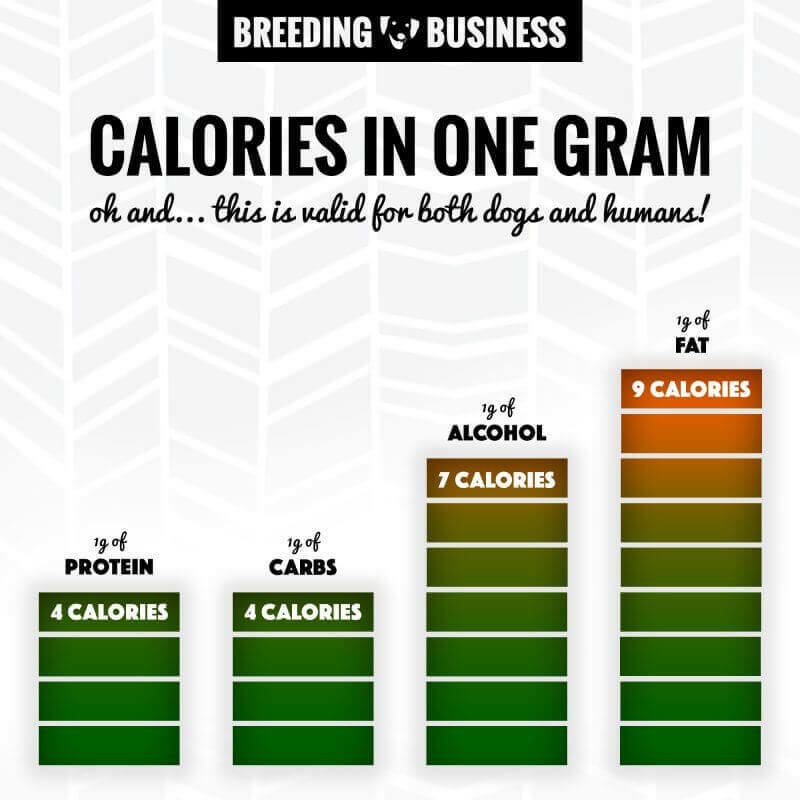 Serving sizes depend on the size and age of the dog. Puppies as young as 12 weeks can start taking these supplements to increase their growth and weight. In only 1.5 months, some users have noticed an incredible difference in the size and structure of their dogs as chest and shoulders are increasingly bulked up. The Crave brand by far makes some of the best puppy foods for weight gain. With 34% protein and real salmon added to its ingredients, dogs are guaranteed some of the highest quality in ingredients and nutrition. This weight gain puppy food, with its high protein, is actually inspired by the diets of the wolf ancestors of the canine. There is no chicken by-product, no soy protein, corn, or wheat and it contains no artificial colors, preservatives, and or flavors. 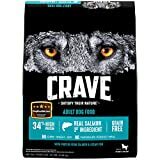 Containing high carbohydrate sources for enhancing energy, the Crave best puppy food for weight gain provides the salmon and ocean fish flavor dogs love while keeping them in top shape. Buyers of Crave claim even their vets approve and recommend this grain-free puppy food. It’s been known to help with itchy dry skin and makes it on the top of the list of canine food for weight gain due to its high quality and reasonable pricing. Any other suggestions with feeding raw? As I refuse to feed my dogs kibble of any brand. When it comes to raw meat, when is it not safe for a dog to eat? Thanks all of this is a great help. Always learning new things. I still have not been able to set the website up that I got from you. I am not at all good with this technology. It will get done one day!